This dish its amazing, you can serve it has appetizer or you can even add the sauce to the pasta... But i like to serve it with bread. Start by boiling the fresh spinach in water with a pinch of salt. Also boil the fresh calamari for 5-10 minutes then place them aside in some ice water, so they can stay soft. In a pan start by cooking the tomatoes. Peel the fresh tomatoes, chop finely and add them to a pan with some olive oil and garlic, season with salt and pepper. 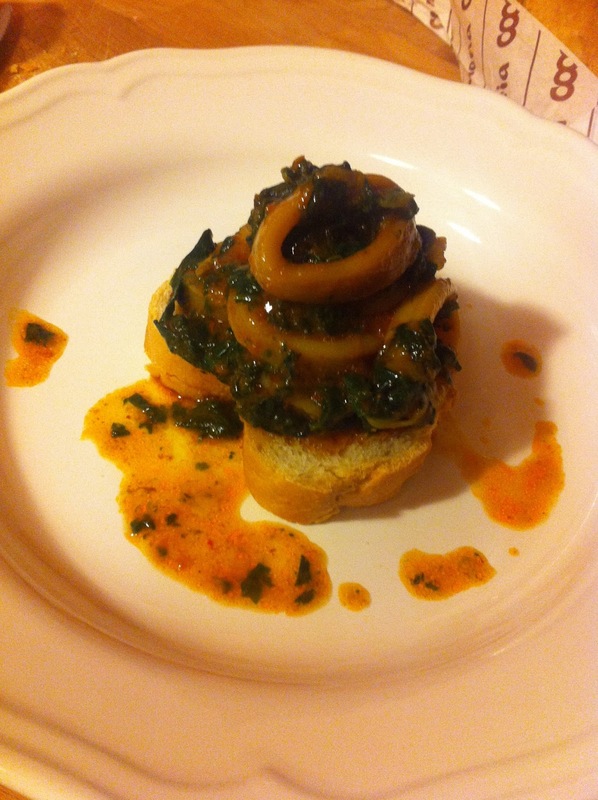 cook through for 10 minutes, add some hot pepper if you like, and then add the cooked spinach with a bit of the cooking water, and also add the calamari, a bit of white wine and combine all together. Cut you some fresh bread, place in oven for 5 minutes if you like it nice and crispy or you can simply use it soft. Serve on top of a piece of bread and let the bread soak all that beautiful sauce. Its amazing. ENJOY! !